Alex and I awoke this morning amazed at the roads we had already traveled. 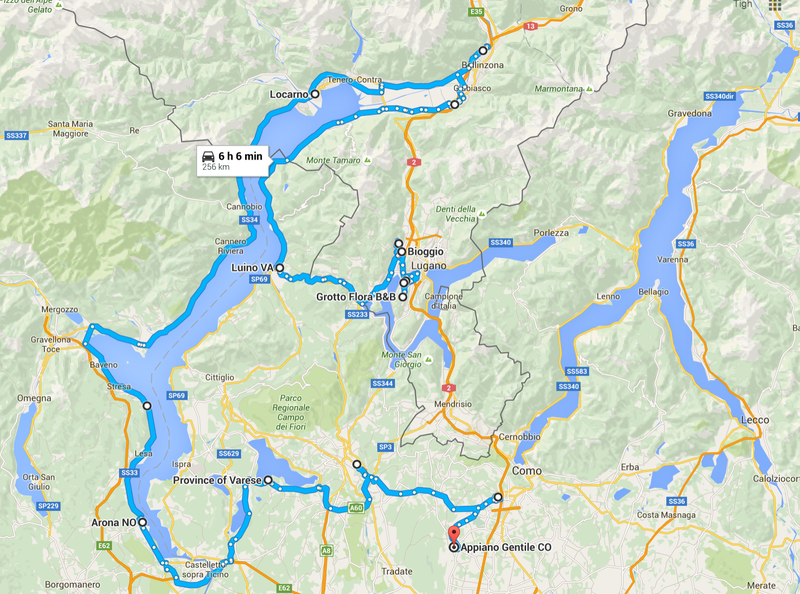 Yesterday we explored nearly the entire western half of Lake Como, as well as most of the periphery of Lake Lugano. Travel has been thoroughly smooth all the way from JFK to Milan to EICMA to picking up our bikes and hitting the road. Newly invigorated from our recent successes, we decided on an ambitious route for the day, to try to explore a THIRD lake, also situated in between Italy and Switzerland, to the west of Lugano, called Lago Maggiore. But, this morning was COLD. After a deliciously quaint breakfast, we packed up the motos, and the temperature gauges displayed 1 Celsius, just above freezing. I had prepared in the week before, investing in Arctic rated thermal underwear, glove liners and a balaclava, and Alex had a heavy winter riding jacket. But as we descended the other side of the mountain westward from Lugano, getting lost on little hillside switchbacks, where astoundingly modern houses perched on hillsides (many people parked their Maseratis and Lotuses on the street), it was cold. However, the sun showed brightly on our backs, and most main highways go straight through mountain (ranges) for miles and miles, where the temperature fluctuates drastically. Aiming for Locarno, the external temperature gauge on our bikes showed 2.5c, and then went up to 22c a few miles into a tunnel. We crossed in and out of Switzerland and Italy, and we saw checkpoints where I believe we were supposed to stop, but whatever authorities in charge of border crossings just waved us through. We stopped A LOT for photo ops, as every little town seemed to have a public waterfront promenade, specifically built around the most picturesque area possible. I also have to admit I feel incredibly guilty. Three or four days probably wouldn’t be enough to immerse myself entirely in any single one of these town’s cultures, and yet we’re spending minutes in each. I made a joke about this trip being tantamount to speed-dating supermodels, as the days are fast, stunningly beautiful (to the point that it hurts how lovely everything is), but I’m left with the feeling I just got a glimpse and a taste of something really special. We snaked around up to Locarno, and down the western coast of Maggiore, headed for Arona, back into Italy from Switzerland. We passed through Ronco sopra Ascona and Canno Riviera, and a hundred other picturesque populations. We passed hotel after hotel, with some palatial waterfront structures seeming to dwarf the fictional Grand Budapest Hotel (though it would fit right in with the funiculars and palm trees). Stopping at an amazing flat area around Gravellona, I believe called Feriolo, we took some amazing pics with the snow-capped Alps towering in the background. Our GPS took us to a ferry in Arona, as the light was beginning to fade, and we realized we hadn’t made hotel reservations yet. It’s really the offseason here, so we have had excellent luck flying by the seat of our pants, booking hotels last minute, usually for under $100 or so. I really wanted to see Varese, but the light was fading by the time we arrived, so we didn’t have too much time to explore. I’ll always remember the vision on the highway I saw as we road into Varese though, of a sprawling terra-cotta metropolis, descending down a vast hill into a valley with distant massive tentacles of lakes licked the base of white capped mountains. Even the Police drive MV Agustas in Varese, like this Tourismo Veloce. With the next day’s ambitious journey in mind, we pushed on to Como, where we stopped into a little café, hooked up to WiFi, and made a reservation for a four-star hotel in a little town called Appiano Gentile. We were surrounded with darkness when we arrived at this hotel, which looked to be in a blue collar area. The room was absurd. Everything was backlit with neon lights, with mirrors on three sides of the bed, with the mirror on the roof carved out in the shape of a four leaf clover. There was a massive glass case with nothing but two tiny champagne glasses and a bottle opener. The hotel was weird, so we left to get some dinner, but we couldn’t find a restaurant besides a McDonalds, which looked like it doubled as a truck stop. I decided to stop at a grocery store, and we went shopping hungry, amazed at the prices, especially for wine, where no bottle was over $3.00. We bought a bottle of champaign, a large bottle of wine, an expensive bottle of grappa $4, three types of breads, two types of fresh cheeses, two packages of cured meats, olives, salad, tomatoes, balsamic vinegar, forks, two boxes of cand`s and more, and the total bill came to 32.79. Elated, we went back to our bizarre room and feasted into the night.